This is a private page for riders only. Included is detailed departure information, important links and schedules. Thank you for stepping up and speaking out for change in our communities, in our country... in our WORLD. we wanted to provide you with some important information. Well, not the whole thing... but we ARE taking over Columbus Alive's Instagram account! Please take as many photos/videos of the workshops, speakers, sign making, news interviews, the march etc. We are so lucky to have such a wonderfully talented and generous group of presenters! Kaleab Jegol is a senior at William Mason High School. Passionate about youth engagement and voting, Kaleab works as the Power To The Polls lead for the Women’s March Youth EMPOWER group and was one of the #ENOUGH national organizers. Kaleab has grown up believing that every person has the power to change the systems of injustice and wrong that they encounter in their lives. Kaleab, as an immigrant and POC, holds intersectionality and the importance of looking at people through multi-lens views an important part of his work. He hopes to someday be a U.S. Senator. Milan Yates is a 10 year old 5th grader at Georgian Heights Elementary School, Columbus, Ohio. Milan has a passion for performing arts and was cast in The Wiz, Once On This Island, and most recently The Color Purple. Art for Milan is a form of activism and she continues her advocacy in cultural expressions for social justice. 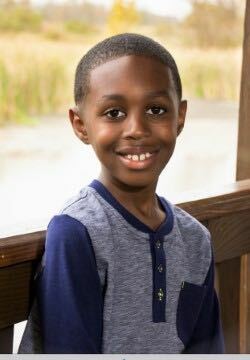 Xavier Thompson is a10 year old 5th grader at Blacklick Elementary school in Gahanna, Ohio. Xavier's interest includes basketball, baseball and playing and creating video games. Xavier gets involved in his community by capturing moments through photo and video of marches, movements and resistance gatherings. Ofc. Marjorie Rizalvo is an 18 years law enforcement veteran and has career highlights that include community policing as a Community Liaison Officer and Bike Patrol Officer. She is a certified Crisis Intervention Officer, specializing in de-escalation verbal skills. As a self-defense instructor she assists the Buckeye Regional Anti-Violence Organization (BRAVO) with personal safety classes. Arianna Palmer is a licensed social worker in the state of Ohio. Arianna received her Associate of Arts Degree in 2015 from Columbus State Community College before transferring to The Ohio State University. During her senior year, Arianna was an intern at The Village Network Reception Center. While still in school, she was offered a full time job as a Behavior Management Specialist with The Village Network. While working full time, Arianna received her Bachelor of Science in Social Work in August of 2017 then went on to pass her licensure exam. At the end of 2017, Arianna accepted a job at The Buckeye Ranch as a Residential Case Manager. She is also currently a Volunteer Youth Director for Integrated Medical & Behavioral Care Associates. Although new to the field, Arianna already knows that her passion is working with adolescents and teenagers. She is driven to make a difference in the lives of others, no matter how big or small. Callie has a proactive and positive approach to therapy. She provides a safe place for people to face the issues that are troubling them and then collaborates with them to develop strategies and solutions to deal with those issues. In working with adolescents and children, Callie’s work goes beyond behavioral interventions and solving school performance problems. She works with parents to develop treatment plans which tap into the strength of the family system and create an environment in which their children and adolescents can achieve their maximum potential. Callie grew up in the Dallas/Fort Worth area of Texas, graduated from The University of Texas at Austin, and later received her Master of Science degree in Family Therapy from Texas Woman's University. Prior to joining ICFT 3 years ago, she worked within behavioral health in Texas for 10 years. In her free time, Callie enjoys spending time with her husband and 6 year old son. 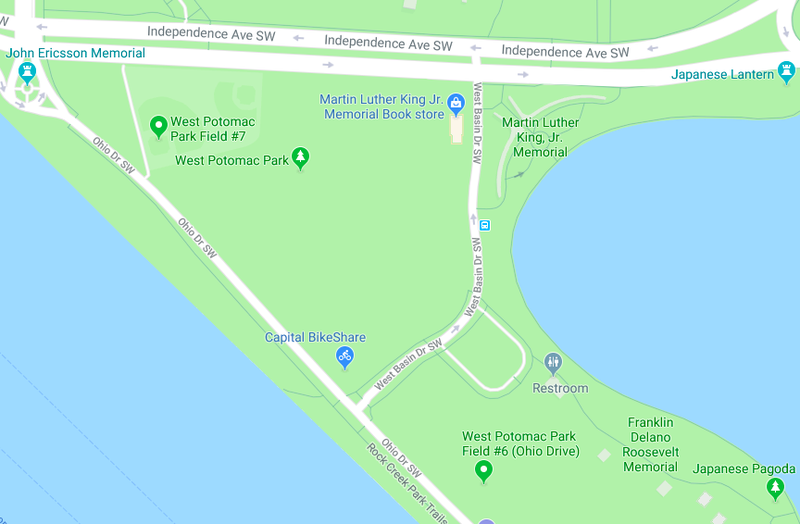 We will be meeting at 530pm by the Capital Bike Share at West Potomac Park (at the corner of West Basin Dr SW and Ohio Dr SW, past the MLK Jr Memorial) for pizza and salad before we board our buses to head home. This is a great opportunity to meet up once again with those you came with, and those you've met along the way, and share your experiences at the march. Streets will be closed in the red area below until 6pm. If you are taking a cab or other ride share to move around the city, you will not be able to ride/drive within these areas. Where is the bus dropping us off in DC? We will be dropped off right in front of the Hard Rock Cafe, just in time for breakfast. Yes, cash is the best option as ATMs may not be operating or available. Please tip your bus driver $10 per person. Although we do not anticipate needing to take the Metro, please bring $15 for a DC Metro Day Pass, just in case. You may want to purchase snacks and drinks on the way to DC, in DC and on the way home. You may also want to purchase MFOL gear, available at the march. Yes, you may bring a small cooler; however, space is very limited on the buses. If the cooler can fit at or between your feet, feel free to bring it! Please be mindful of taking up space, as we have 3 very full buses. Unfortunately, the bus from Cleveland will not have WiFi onboard. Will there be electric outlets onboard? Yes! Electric outlets are available on all buses. Can I leave things on the bus while I march? Yes, the buses will be locked and away from the march area and you will be able to leave things on the bus. RISE Travel and its' partners are not responsible for any items lost, stolen or damaged. We do not recommend bringing items of value (monetary or sentimental) on this trip. Can I bring a banner? Yes, banners and signs smaller than 20’ x 3’ x ¼” are welcome. We encourage wearable, foldable, and rollable banners and signs. Please do not mount signs on wood or metal sticks or posts as they will not be allowed in. Poles and posts will also not be allowed on the Metro. What items are prohibited at the march? Any other items that may pose a threat to the security of the event as determine by and at the discretion of the security screener. Where are the march entrances? There will be NO access to the Rally from the East. What time does the rally begin? Where does the March For Our Lives rally take place? 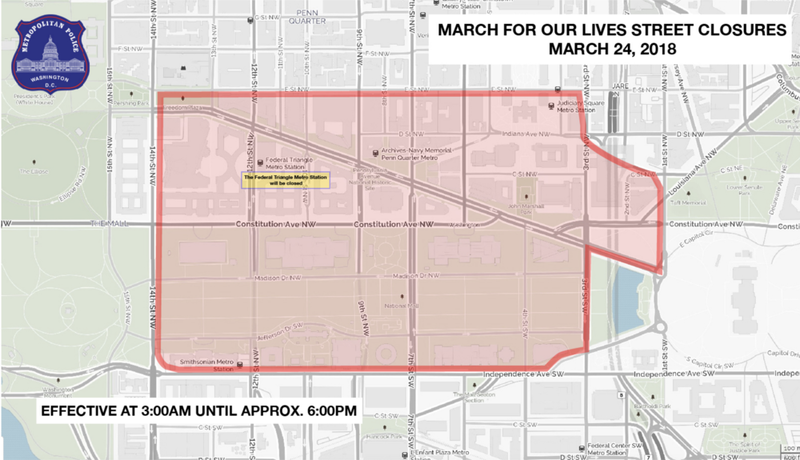 The March For Our Lives Rally will take place on Pennsylvania Avenue, between 3rd and 12th street NW. Yes, there will be regular and ADA accessible port-o-johns onsite. March weather in Washington, DC is variable. Wearing several layers of loose fitting, lightweight, clothing is better than wearing one layer of clothing. Consider the weather forecast when choosing clothes and shoes for your trip to Washington, DC. Weather forecasts are available from the National Weather Service website and Twitter account @NWS_BaltWash.